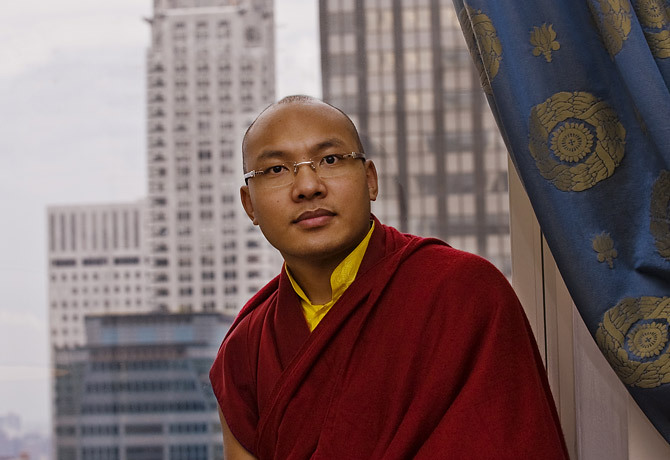 The 17th Karmapa Ogyen Trinley Dorje. (TibetanReview.net, Jul12, 2016) – A rally was held in Sikkim’s capital Gangtok on Jul 10, demanding that New Delhi permit the 17th Karmapa Ogyen Trinley Dorjee to visit the state and bless his followers there. The Karmapa had fled his Tsurphu Monastery in Chinese ruled Tibet in Dec 1999, citing lack of religious freedom, and arrived at Dharamshala, Himachal Pradesh, in Jan 2000. However, the government of India has not permitted him to proceed to his exile seat of Rumtek in Sikkim ever since. The large rally was organized by the Denjong Monasteries Chogchen. Those who participated in it were reported to have included the state’s former chief minister Narbahadur Bhandari, the Sangha state legislator (MLA) Sonam Lama, local MLA Kunga Nima Lepcha and others. One of the reasons widely cited for New Delhi’s reluctance to allow the Karmapa to visit Sikkim is that there is a rival Karmapa reincarnation claimant, namely Thaye Dorje, put forward by the late Shamarpa Rinpoche, a relative and one of the four regents of the previous Karmapa Rangjung Rigpey Dorje. However, Ogyen Trinley Dorjee was recognized by the regency led by Tai Situ Rinpoche who was said to have later played a role in his escape from Tibet. Ogyen Trinley Dorjee’s recognition was endorsed by Tibet’s exiled spiritual leader, the Dalai Lama. The government and people of Sikkim have held rallies and sent petitions to the New Delhi over the years, pleading that the Karmapa Ogyen Trinley Dorjee to be allowed to visit Sikkim and take his seat at Rumtek. Online reports now suggest that the government of Sikkim has appointed Acharya Tshering Lama of Simick Chandey as the Chairman of the state’s Ecclesiastical Affairs Department to initiate the process of requesting New Delhi to allow a visit by the Karmapa. A section of the Indian intelligence is said to be sceptical about the Karmapa’s escape from Tibet, which probably explains why he has to seek permission from New Delhi for any travel outside the precincts of Dharamshala town. He has recently been permitted more visits to places both within India and abroad. However, there have been no indications that New Delhi is about to finally allow the Karmapa at least a visit to Sikkim. The main reason for that may be that there is a court case on the question of succession to the Karmapa throne at Rumtek. Sikkim’s capital is Gangtok not Kathmandu. Let karmapa visit Sikkim .